North Africa is in the midst of its Arab Spring as weeks of protests have seen the overthrow of long-term dictators. Many were disheartened at the outcome of the original Arab Spring that began back in 2011.Tunisia saw a full transition away from the former regime, only for An-Nahda to turn their back on Islamic rule, today the right-hand man of Ben Ali is back in power. In Egypt, the Muslim Brotherhood abandoned Islamic rule and saw the public turn against them as their rule was characterised with failure, eventually leading to a coup by the military, today the military is back in power. In Syria, Yemen and Libya the countries have been devastated by foreign interference and wars. North Africa is once again in state of flux as many have taken to the streets to demand real change and have had enough of long-term dictators who have looted the country. In Sudan and Algeria in 2011, some took to the streets to demand change, but in both cases, demonstrations were limited and in Sudan, they were crushed. It seems in 2019 lessons have been learnt from the original Arab Spring where much of the existing system was maintained by military leaders. Algeria is the second-largest landmass among countries in Africa, along with the largest population among its six Saharan neighbours. The country is home to valuable energy reserves that have provided a steady stream of exports flowing to southern Europe for decades, along with thousands of miles of resource-rich Mediterranean coastline. But despite having all these advantages Algeria has been dominated by the army who has monopolised this wealth. Successive governments also made personal use of the country’s energy wealth leaving the countries people suffering from poverty and deprivation, 12 million of Algeria’s 40 million population live in poverty. Long term autocrat Abdelaziz Bouteflika changed the constitution in 2008 amending the condition of restricting the president’s term to two terms only to four. Despite a stroke in 2013 and not being seen in public, Bouteflika officially submitted his candidacy for the April 2019 elections in March 2019. This was the final straw for the masses who took to the streets and protested and their numbers have only grown. In Sudan Omar Bashir long used tribal differences for his own advantage which ensured a unified opposition to his rule would never emerge. Bashir executed all of America’s agenda which included the separation of South Sudan. The US used various inducements and punishments to keep Omar Bashir in line. Despite Sudan being blessed with natural resources and mineral wealth most of its population languished in poverty. But by surrendering South Sudan the oil fields were lost and an agreement to share the oil revenues broke down leaving Sudan with little to no hard currency. In 2018 the government tried to conceal the dire economic situation by pointing to the removal of US sanctions. But the lack of hard currency saw the removal of subsidies on bread, leading to prices to double and inflation to spiral out of control. The government tried to print its way out of this problem, which only made matters worse. In December 2018, demonstrations broke out in several Sudanese cities, due to spiralling costs of living. The protests quickly turned from demands for urgent economic reforms into demands for Omar al-Bashir to step down. In February 2019, al-Bashir declared a state of emergency and dissolved the national and regional governments, replacing them with military and intelligence-service officers. The protests then grew even larger. In both countries the army has stepped in and removed the rulers to placate the demonstrators. In Algeria the army chief of staff, Ahmed Gaïd Salah, effectively removed the president, stating he was physically unable to perform his role. Whilst in Sudan On 12 April 2019, the head of the transitional military council in Sudan, Awad Ibn Auf, announced Omar Bashir’s abdication. In both cases the army removed men who were a spent force in order to be seen to be on the side of the protestors and introduced transition periods with the army in charge. This is the Egypt model which was used by the army to maintain their position when they removed Hosni Mubarak in 2012. The Muslims of both nations need to ensure their revolutions are not hijacked by foreign powers or the army who protects their interests. This requires them to continue on their current trajectory and call and work for a complete change in system. This requires them to come up with detailed positions on a transition to nothing other then Islamic rule. Anything short of this will see both countries turn into Egypt or Tunisia. In Sudan already there has been a reshuffle in those that ousted Omar al-Bashir, it seems the faces the army are placing are not being accepted by the people. 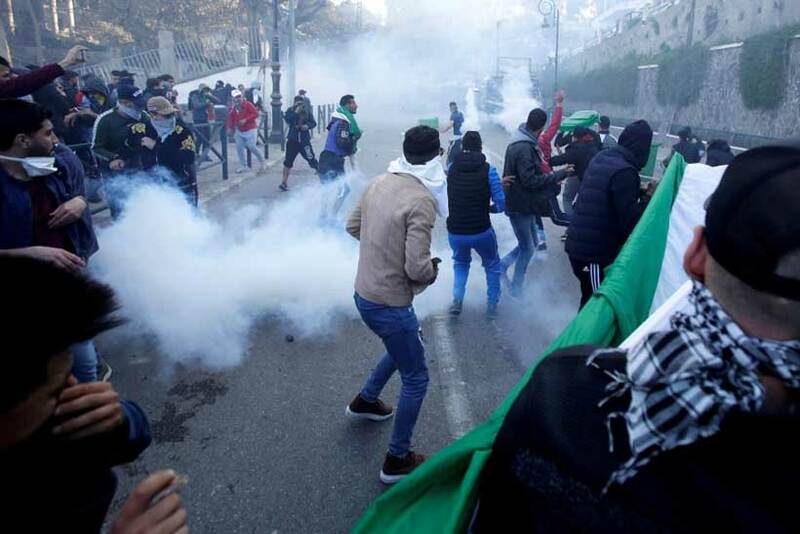 In Algeria the protesters originally wanted Abdelaziz Bouteflika to withdraw his candidacy for a fifth term and wanted Prime Minister Ahmed Ouyahia to step down. Despite this taking place the people of Algeria are calling for a massive housecleaning from the government of the ruling clans, known collectively as le pouvoir. It remains to be seen if real change is finally taking place in a Muslim nation, but it seems lessons have been learnt from the first Arab Spring.